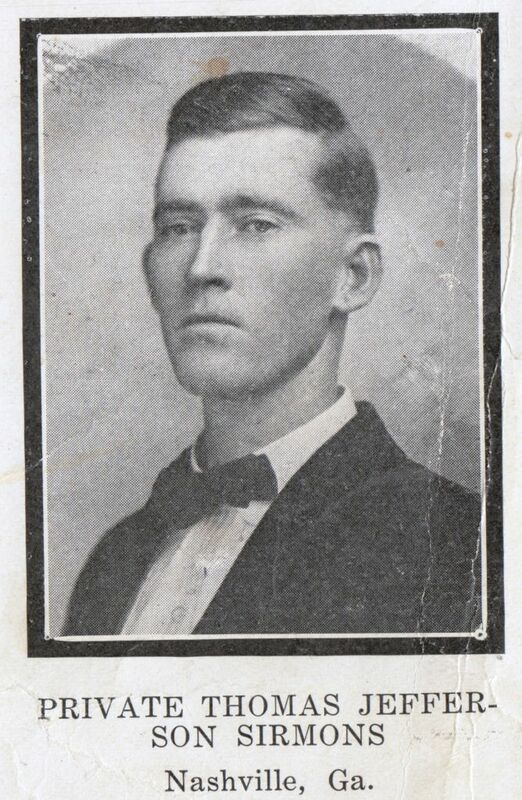 Another news item from the Watson Grade community, near Ray City, GA was the death of J. E. Sirmans, which occurred on March 12, 1904. Of course, the name of Sirmans itself variously appears in historical records as Sirmons, Sermans, Simmons, and in other forms. In this case there has been some mystery over the given name as well. It seems that this son of Benjamin E. Sirmans and Francenia Carroll is known in many family genealogies as Jesse Carroll Sirmans. But his census, tax, and marriage records, as well as the obituary above, indicate that his name was actually Jesse E. Sirmans. Who was J. E. Sirmans? 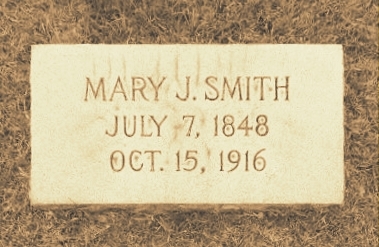 The census records of 1900 show that Jessie E. Sirmans owned a farm in the 1300 Georgia Militia District in the neighborhood of the Patten and Watson families a few miles northeast of Ray City. 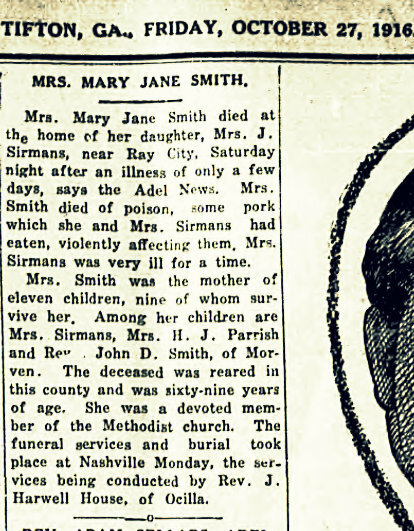 At the time of his death in 1904, Jessie E. Sirmans had ten children, matching the obituary above. Jessie Sirmans’ eleventh child, Eugene Sirmans, was born eight months after his death. 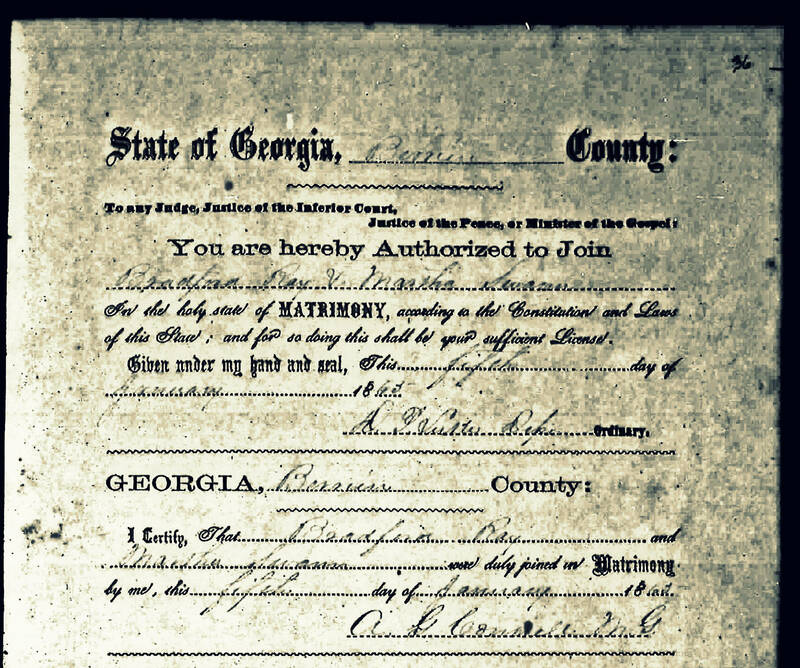 Jesse’s father, Benjamin E. Sirmans was a farmer in Clinch County, GA. “Records show in 1854 he purchased land in lot 436 of the tenth district of Clinch County from Martin Mattox.” Jesse was born about 1859, and first appears in census records in 1860, at age 1. 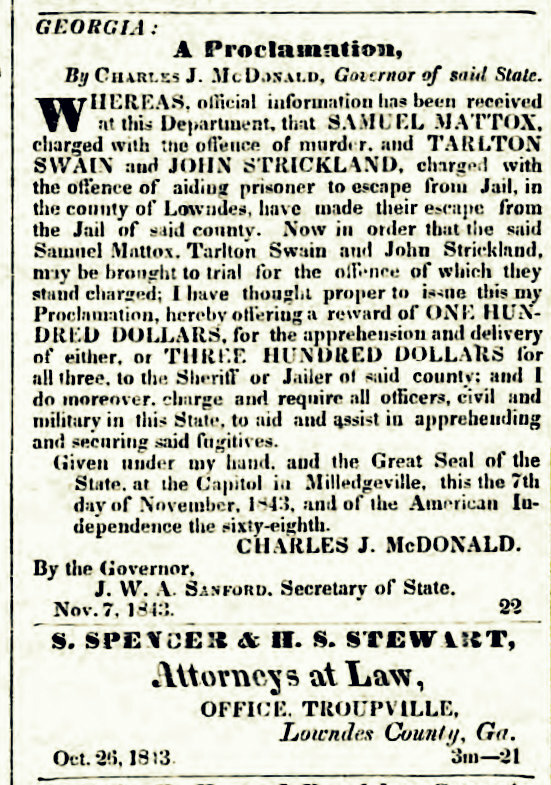 In 1860, the Sirmans were neighbors of General David Johnson, who fought in the Indian Wars of 1836, and who was an uncle of Benjamin E. Sirmans. 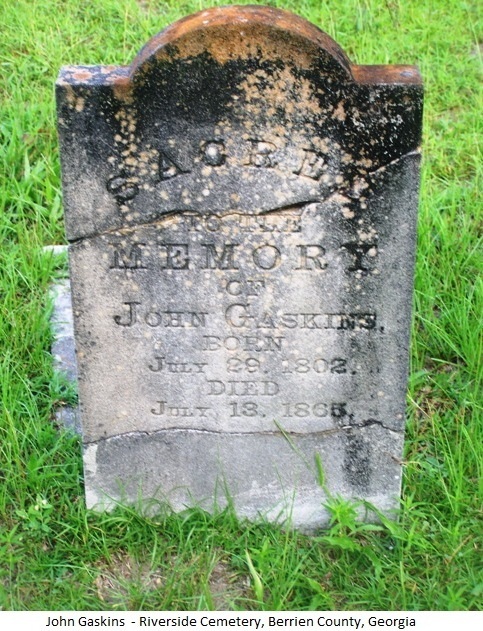 When Jesse was about 18 years of age his father died , expiring on November 22, 1877. 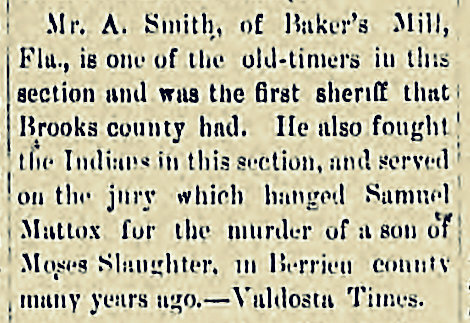 Benjamin E Sirmans was buried in Fender Cemetery, Lanier County, GA. 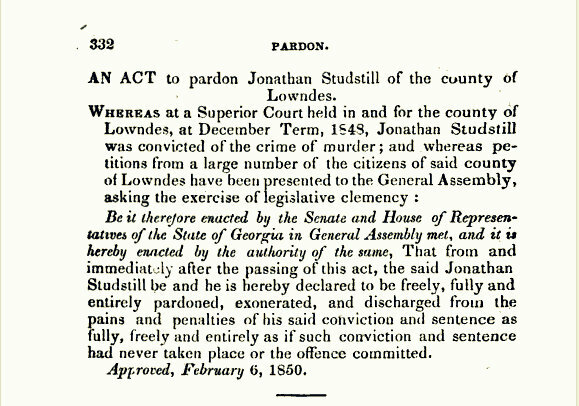 He left an estate of ” approximately 400 head of cattle and land in Lots 437 and 438 in the seventh district of Clinch County, GA. Jesse’s uncles, Ezekiel Johnson Sirmans and David J. Sirmans, acted as executors for the estate and sold off the cattle to pay his father’s debts. According to tax records of 1880 Jesse’s mother, Francenia Carroll Sirmans, owned 264 acres on parts of lots 437 and 438 in the 7th Land District,(GMD 586, Mud Creek District) this land valued at $400. On November 4, 1880, Francenia sold her portion of the estate to Jesse’s uncle, Senator Franklin B. Sirmans. 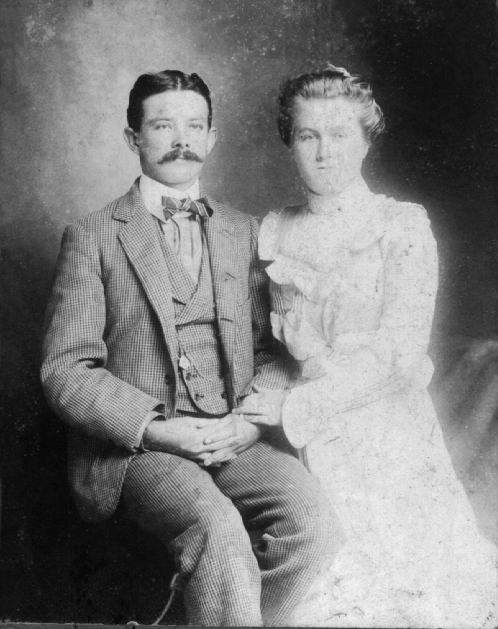 A few months later, on April 3, 1881, Francenia married Henry Mainor. 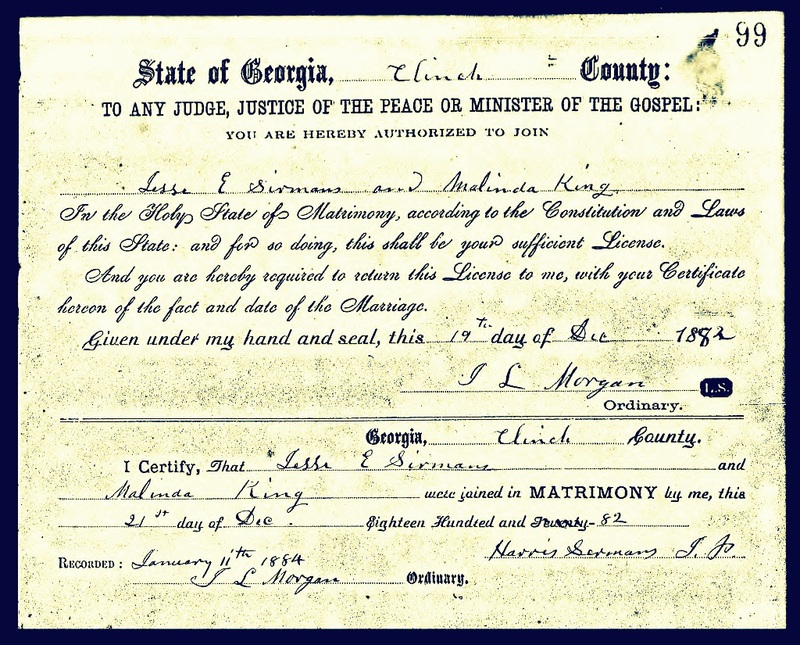 The 1880 enumeration of Jesse E. Sirmans has not been located, but it appears that he continued to reside in Clinch County, GA.
On December 21, 1882, Jesse E. Sirmans married Malinda King in Clinch County, GA.
December 21, 1882 marriage license of Jesse E. Sirmans and Malinda King, Clinch County, GA.
Tax records show by 1886 Jesse Sirmans owned 405 acres on Lot 484 in the 7th Land District,(GMD 586, Mud Creek District) this land valued at $150. By 1887 it appears he had disposed of some of the less valuable acreage, retaining 210 acres on Lot 484 in the 7th Land District,(GMD 586, Mud Creek District) this land valued at $150. In 1890 he owned 410 acres on lot 484 in the 7th Land District,(GMD 586, Mud Creek District) this land valued at $200. 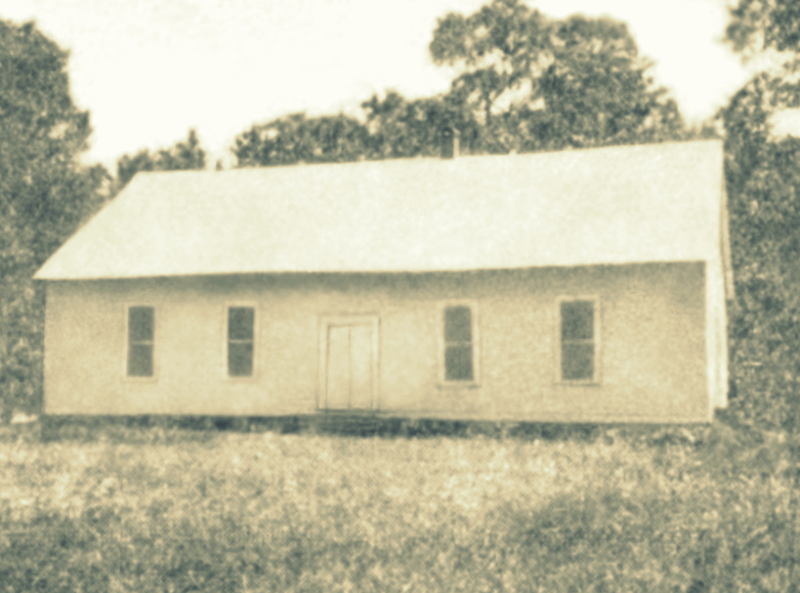 Some time before 1900, Jesse E. Sirmans relocated his family to Berrien County where he farmed in the Watson Grade community, just northeast of Ray City, GA. His aunt Lucretia Sirmans Cook resided at Watson Grade with her husband John Jasper Cook, and children (Charlotte Cook, Melvina Cook, Aaron Cook, Sarah Ann Cook, James Cook, and Mary Ellen Cook) as did others of the Sirmans and Cook family connections. 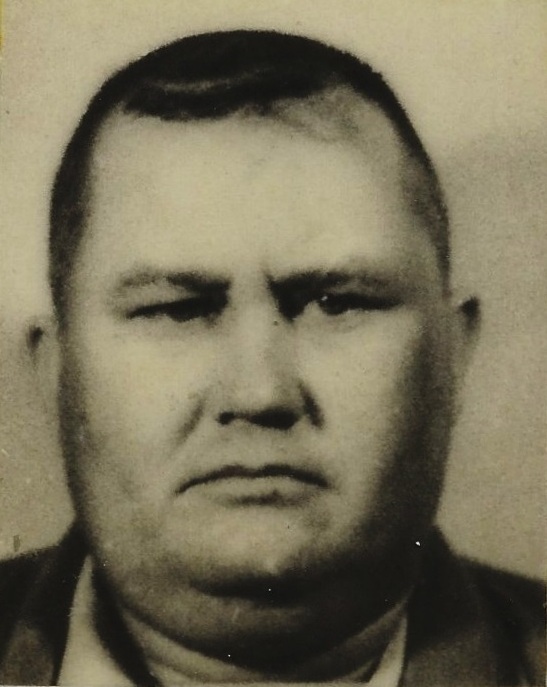 Hyman Hardeman “Brocy” Sirmans (1919 – 1969) of Ray City, GA was a son of Mamie and Daniel W. Sirmans. Hyman Hardeman “Brocy” Sirmans of Ray City, GA.
H. H. Sirmans was born on March 22, 1919 at Ray City just in time to be enumerated in the census of 1920. 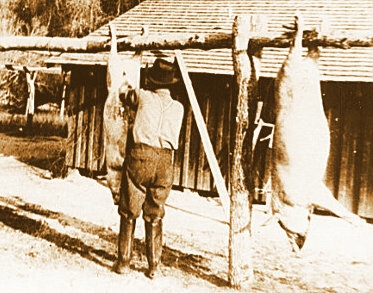 His father rented a farm on one of the settlement roads near Ray City. Next door was John and Anne Sirmans Matheny, and on the adjacent farm, George W. and Mary Fender. 1920 enumeration of the household of Daniel W. Sirmans. Hyman H. Sirmans was enumerated in the Census of 1930 in his father’s household at Ray City, GA. 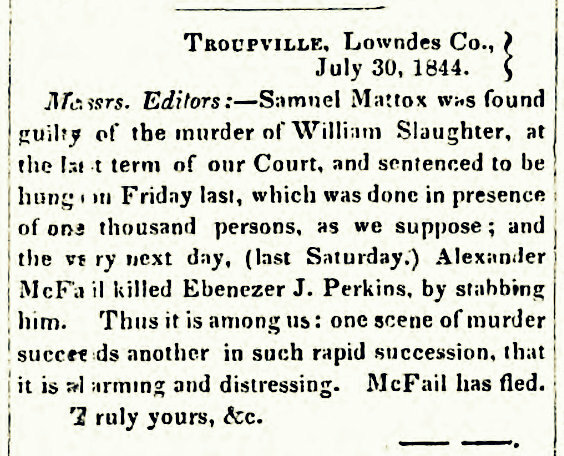 He was 11 years old, and attended school along with his sisters Lerine and Victoria. Edith and Margaret were too young to attend. 1930 enumeration of the household of Daniel W. Sirmans. Hyman H Sirmans worked on a Liberty Ship during WWII. His service records give his physical description as 5′ 6″ tall, and 228 pounds. He began his service at sea in 1940, and served as a Fireman/Watertender on the S. S. William G. Lee. 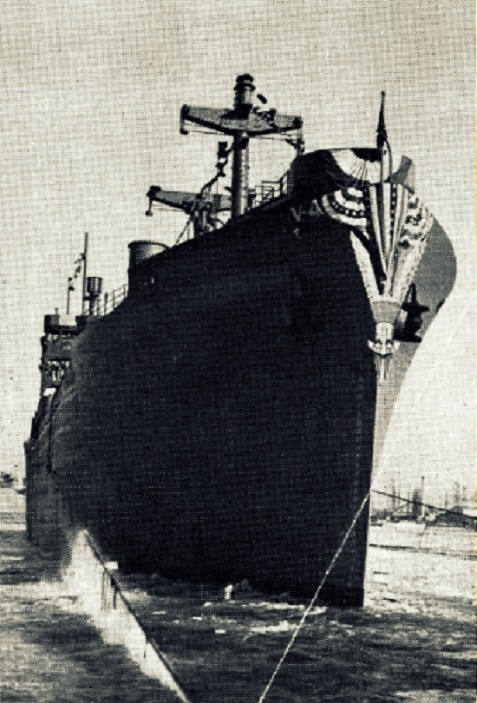 The William G. Lee liberty ship was built in Savannah, Georgia by the Southeastern Shipbuilding Corporation. 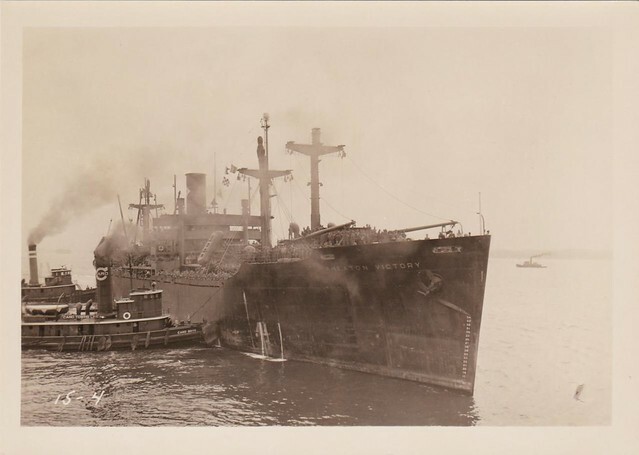 The WWII liberty ship S. S. William G. Lee, photographed after the war. “Liberty ship” was the name given to the EC2 type ship designed for “Emergency” construction by the United States Maritime Commission in World War II. Liberty ships were nicknamed “ugly ducklings” by President Franklin Delano Roosevelt. The first of the 2,711 Liberty ships was the SS Patrick Henry, launched on Sept. 27, 1941, and built to a standardized, mass produced design. (2,710 ships were completed, as one burned at the dock.) The 250,000 parts were pre-fabricated throughout the country in 250-ton sections and welded together in about 70 days. 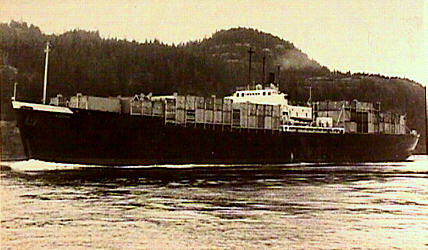 One Liberty ship, the SS Robert E. Peary was built in four and a half days. A Liberty cost under $2,000,000. As a Fireman/Watertender on the S.S. William G. Lee, H. H. Sirmans would have been responsible for tending to the fires and boilers in the steam ship’s engine room. 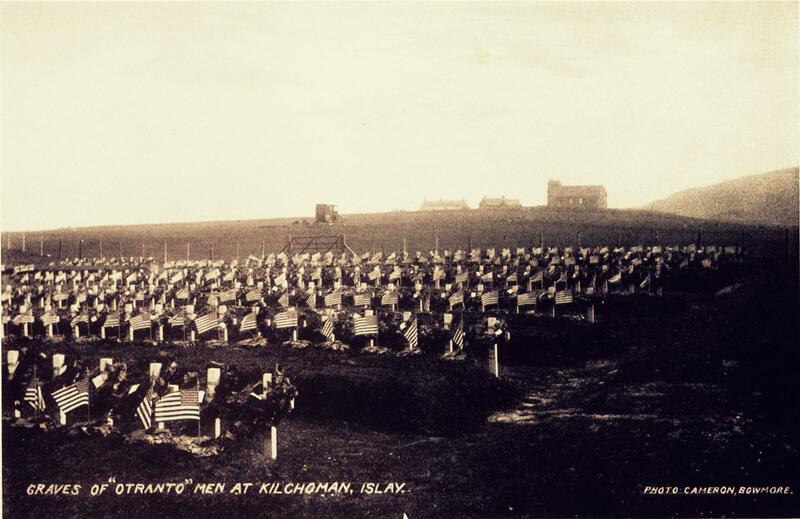 His duties would have included tending the boilers to maintain steam at specified pressure, and regulating the amount of water in the boiler, observing gauges, and cleaning equipment and work area. He may have also done maintenance and repair work in the fireroom and engine room, and monitored operation of evaporators and condensers used to convert salt water to fresh water. 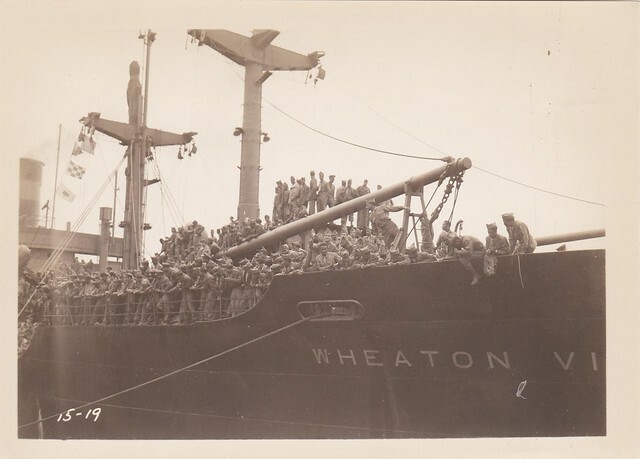 The William G. Lee was launched in July, 1944 and made numerous Atlantic crossings during WWII. 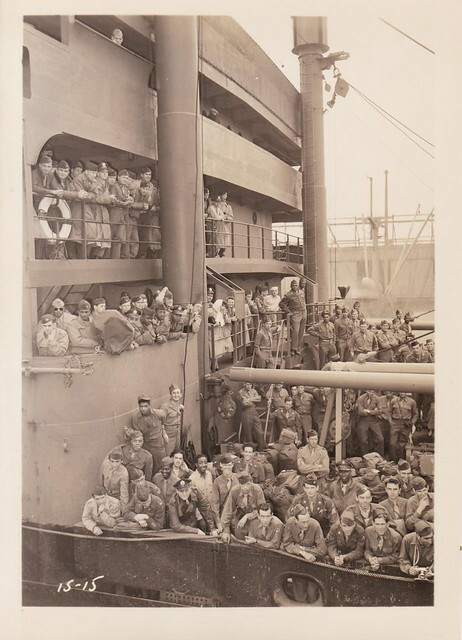 According to the ConvoyWeb database for Merchant Ships during WW2, the William G. Lee departed from NYC on July 25, 1944 with Convoy HX.301, and arrived at Liverpool, England on August 8, 1944. She departed Methil, Scotland with Convoy FS.1541 on August 11,1944 for Southend, England, arriving on August 13, 1944. She departed Southend, England with Convoy FN.1455 on August 20, 1944, for Methil,Scotland. Two days later she departed Methil Scotland with Convoy EN.425 on August 22, 1944 bound for Loch Ewe, Scotland, arriving August 24. 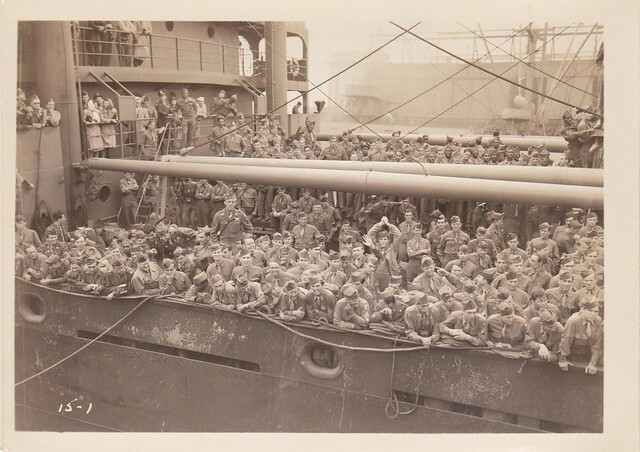 She joined Convoy ON.250 departing from Liverpool and arrived NYC on September 7, 1944. She departed from NYC on October 5, 1944 with Convoy HX.312, and arrived at Liverpool, England on October 21, 1944. 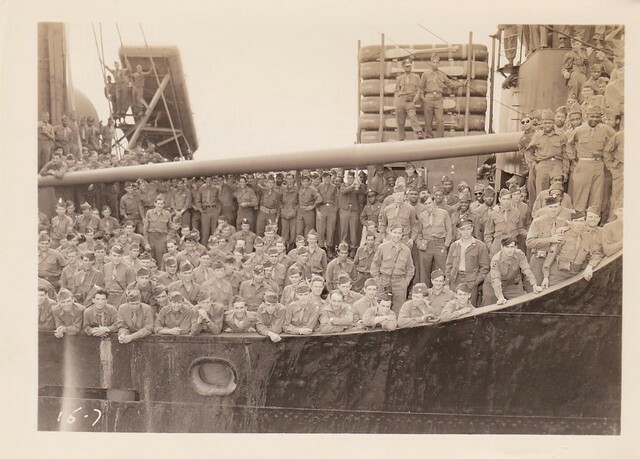 She joined Convoy ON.267 departing Southend on November 18, 1944, and arrived NYC on December 5, 1944. 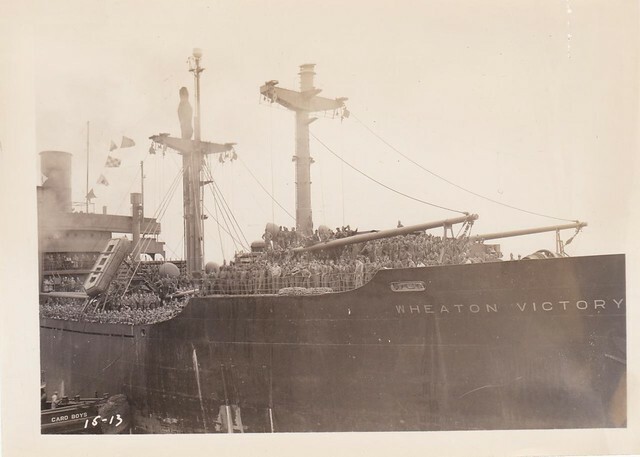 She departed Boston, MA with Convoy BX.138 on December 21, 1944, arriving off Halifax on December 23. 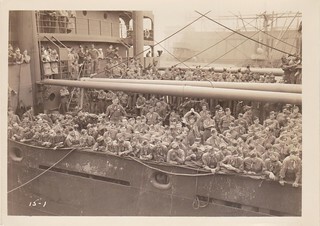 She joined Convoy HX.328 departing from NYC on Christmas Eve, 1944, arriving at Liverpool England on January 8, 1945. On January 10, 1945, she made the run from Southend with Convoy FN.1598, bound for Methil, Scotland. Nine days later, she made the return run with Convoy FS.1702. She departed Southend with Convoy ON.280 on January 22 1945, arrived NYC on 9 February 9, 1945. 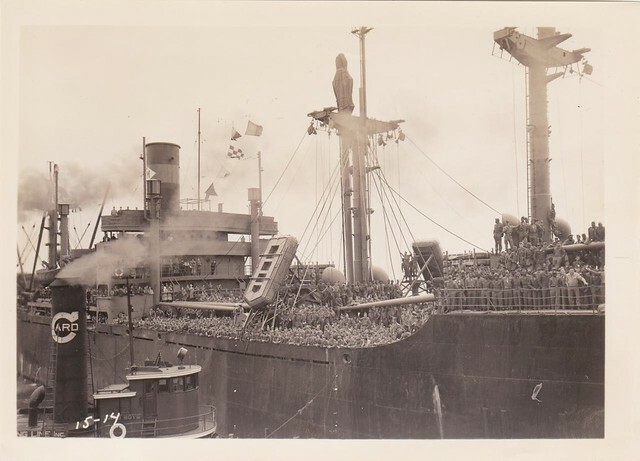 She joined Convoy HX.341 and departed NYC on February 28, 1945, arriving at Liverpool England on March 15, 1945. On 27 March 1945 she departed Southend with Convoy ON.293, and arrived NYC on April 15, 1945. She departed from NYC on May 3, 1945 with Convoy HX.354 and arrived Liverpool on 18 May 1945. 1969 Obituary of Hyman Hardeman Sirmans, Ray City, Berrien County, GA.
LAKELAND, Ga. – H. H. (Brocy) Sirmans, 49, of Ray City, died at his home early today of an apparent heart attack. He was born and lived all his life in Berrien County. He was a member of Ray City Baptist Church, the National Farmers Organization and the Farm Bureau. Survivors are his wife the former Marjorie Garner; a daughter, Patricia Ann Sirmans of Valdosta; mother, Mrs. Mamie Sirmans of Ray City; four sisters, Mrs. Lerine Harris and Mrs. Margaret Stalvey and Mrs. Edith Peters of Ray City and Mrs. Victoria Bradly of Savannah. Funeral services are to be held at 3 p. m. Wednesday at Ray City Baptist Church with burial at Beaver Dam Cemetery. The body is to be taken to the residence late today. Music Funeral Home of Lakeland is in charge of arrangements. Active pallbearers are to be Jackie Giddens, Murice Lankford, Marvin Harris, J. Bart Gaskins, Clyde Miller, Albert Studstill, James Swindle and Lonnie Plair. 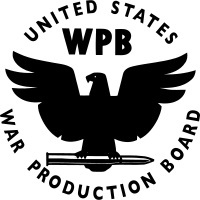 Honorary pallbearers are to be Walter J. Gaskins, Billy Clements, Glen Lee, John David Luke, Lawson Fountain, Sam Barker, Joe Latham, Jack Knight, Herbert Allen, Thomas Patten and Leland Kent.